With livestock fencing for sheep, goats, and alpacas, there are three main options to choose from. Livestock fencing not long keeps the animals in a desingated area, but it also protects the areas from potential predators, such as coyotes, bobcats, and domestic dogs. Hi-tensile wire fencing usually contains one to ten strains of wire and is electrified to keep animals in and predators out. Some sheep will still dive under the wire, and sheep's wool tends to protect them from the electric current. Hi-tensile fencing does require weed control because of low wiring near the ground. Board fencing is also often used for animal containment. Livestock cannot get under or go through this type of fencing, as is the case with wire. It offers you an aesthetically pleasing look and peace of mind, but still requires a hot wire strand around the outside to prevent animals from digging in. Often it takes four or more boards to get the height you want to contain your livestock, and board fencing does require some maintanence, such as painting and replacing the boards. Woven wire fencing offers peace of mind that your livestock cannot get out (unless you leave the gate open!) 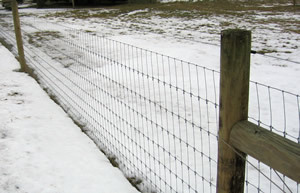 The wire protects the sheep, goats, and alpacas from predators, and the tight wire pattern is designed to keep young and mature animals alike contained. Weed control is not a major concern with this type of fence, and it can be used for other animals as well, including chickens, beef cows, horses, and your pets. The price is comparable to 10 wires or four boards. The only drawback of wove wire fencing is you may still want an offset around the perimeter to deter dogs or other animals from digging at the base of the fence.